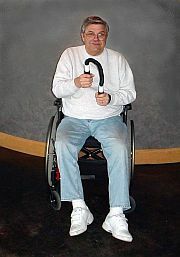 HeartFlex Wheelchair Exercise Equipment is lightweight (only one half pound) to minimize damage and injury if dropped. It is powered by a passive resistance assembly and cannot snap back and cause injury like springs and bands. HeartFlex wheelchair workout equipment offers seated exercises that build grip, wrist, forearm and upper body strength. Easy resistance facilitates multiple repetitions which stimulate the cardio vascular system. HeartFlex wheelchair fitness equipment produces strong hands and arms with increased overall fitness which are essential for the performance of everyday functional tasks. Choose different HeartFlex movements to target specific upper body muscles and joints. Vary the number of repetitions performed to determines the intensity of strength training workouts. Make wheelchair workouts as easy or challenging as desired. Improve functional muscles for increased independence. Heart Flex is small enough to fit in a drawer or on a bedside table. Keep it handy for use throughout the day. It weights less than one pound. Heart Flex wheelchair workouts are quiet and will not disrupt conversations, listening to the radio, or watching television. 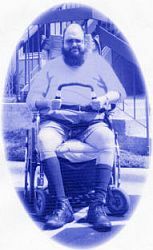 "Hi again John, Just to let you know I think the HeartFlex is great - it has helped me so much giving me more strength to use my wheelchair with less arm and shoulder pain. Just purchased a second one as a gift for my brother so he can prepare for the Cricket season here in England. Many thanks for everything." - Regards Jude W.
HeartFlex is 25" long. Its handles are 1 1/2" diameter soft rubber for improving grip. It weighs one half pound. It's easy to store and fun to use. Its silent operation allows the enjoyment of the TV, radio, or conversations while performing wheelchair workouts. The key to toning and strengthening upper body muscles and improving physical fitness with HeartFlex is multiple repetitions, not strenuous activity. Fitness goals for people using wheelchairs are increasing and HeartFlex is the safe and easy way to build upper body strength, stamina, and endurance. It utilizes new technology and should not be confused with either dangerous weights or other devices using springs, rubber bands, or bows that can snap back and cause injury. HeartFlex exercise machines for wheelchair users builds hand, wrist, arm, forearm, shoulder, chest, and back strength while improving overall physical fitness. HeartFlex wheelchair workouts are easy and fun and by increasing repetitions they can be made as easy or challenging as desired. HeartFlex produces the physical benefits which occur when upper body strength, vascular, pulmonary, and lymphatic circulation is increased. Trainers have called HeartFlexing "swimming without the water." HeartFlex wheelchair workout equipment is ideal for everyone desiring a stronger upper body, more flexibility, and increased stamina. "If, for any reason, you are not completely satisfied with your Heart Flex, simply call or email me for easy instructions on how to obtain a full refund (this refund includes ALL shipping costs)."